Authentication and legalization of our signatures and seals as Notary Publics. ​More questions but not sure you wan to contact us just yet then check out our FAQs: Notary Public and Commissioner for Oaths, and other helpful information in our Legal Updates. Our standardized flat rate fees and account estimate are based upon our standard form of documents, standard services which: For notary public and commissioner for oaths services – includes our standard form of documents and standard service and are for services as a Notary Public and Commissioner for Oaths only and not for legal advice and services as a Lawyer. There may be additional fees for additional services depending upon the requirements of your matter. Additional charges may apply for additional time and non-standard services and documentation required. Requests to meet at a remote location [location other than Lopatka Law] or outside our standard business hours or to have documents signed at a remote location can be accommodated and additional fees may apply. Additional terms and limitations may apply so please can contact us for more details and particulars of the legal services included in our standardized flat rate fees. Please see our account estimate for some of the additional details, terms and conditions. Submitting a request for an account estimate does not create a solicitor client relationship and you should not provide us with confidential information until we have been formally retained in writing and have provided you with a retainer letter signed by a lawyer of this firm. A Notary Public has all the powers of a Commissioner for Oaths, however a Commissioner for Oaths does NOT have all the powers of a Notary Public. ​Also when a document is intended to be used outside of Alberta, the law in that jurisdiction must be followed and while other jurisdictions will have different formalities very often other jurisdictions require that the documents be completed by a Notary Public rather than a Commissioner for Oaths. What do Notaries and Commissioners Do? Notaries Public and Commissioners for Oaths fulfill an important function in our society and fulfilling their duties requires more than just signing documents. Authentication and legalization of their signatures and seals. Sworn or solemnly affirmed affidavits, statutory declarations, and notarial certificates and certifications play an important role in the functioning of not only our legal system but our society at large. Administering oaths, affirmations and declarations plays an important role in ensuring that the truth, the whole truth and nothing but the truth is provided in a variety of contexts where it is important that the truth be told and that a party that fails to provide the truth faces legal consequences for doing so including and an almost limitless number of circumstances, transactions and areas of the law that this arises. ​Notaries Publics also provide a large variety of certificates that have a certain legal effect depending upon the context [see the comment upon Notarial Certificates and Guarantee Acknowledgement Act Certificates below]. Don't Notaries and Commissioners just sign documents? Being a Notary Public and Commissioner for Oaths is more than just signing from time to time. Sets out the procedures for exercising powers as a Notary Public or Commissioner for Oath. ​The Act specifies a code of conduct and complaints process for respecting non-lawyers acting as notaries and commissioners. The code of conduct and complaints process may be of importance when dealing with non-lawyer notaries and commissioners that are not subject to the Law Society of Alberta’s code of conduct and complaints process as Lawyers are. is otherwise lacking valid legal effect. This is important because while these obligations are not new for Lawyers, it imposes the same obligations upon all notaries and commissioners [lawyer and non-lawyer alike] NOT to notarize or commission a document without inquiry and satisfying their obligations under the code of conduct. If the notary or commissioner cannot satisfy their obligations under the code of conduct, then they cannot notarize or commission the document as they are obligated to ensure that in exercising this office they are not involved in certain mischief outlined in the code of conduct, and in particular mischief that has arisen with improper legal proceedings as described Meads v Meads, 2012 ABQB 571. ​The Meads case is noteworthy, because Justice Rooke outlines in detail the mischief that can arise from the improper legal proceedings and misuse of the Court's resources, and perhaps provides the context through which the obligations of lawyers and now non-lawyers commissioners and notaries to avoid being involved in such mischief are to be considered. Why do i need to see a notary public for a personal guarantee? Sign the certificate before the lawyer. 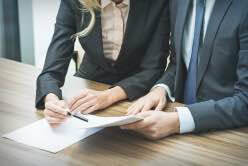 ​The lawyer is obligated by the Guarantees Acknowledgement Act and its regulations to satisfy him or herself that guarantor is aware of the contents and understands it and provide a certificate evidencing the same both in accordance with the Guarantees Acknowledgement Act, but also in accordance with his or hers professional obligations as a Member of the Law Society of Alberta. Notarial Certificates are certificates issued by Notaries Publics certifying the attached copy to be a true copy of the original document inspected by the Notary Public at the time of issuance of the Notarial Certificate. The Notarial Certificate is of importance because there is often legislation and rules of law that permit the Notarial Certificate to stand in place of the original. For instance, in Alberta section 45 of the Alberta Evidence Act, R.S.A. 2000 c. A-18 provides that a notarial certified copy of a document [certified by the notary to be a true copy of the original] is receivable in court proceedings as evidence in place of the original copy with the certified copy having the same force and effect as the original would have if produced and proved. what is authentication and legalization [consularization]? Whether authentication and legalization [consularization] is required will largely depend upon jurisdiction where the document is intended to be used and for what use that document is being put to. If authentication is required, then a document that is notarized by a Notary Public in Alberta is sent to the Deputy Provincial Secretary's Office [who holds the official records of Notaries Public, their signatures and seals] to obtain a certificate authenticating the appointment, signature and seal of the Notary Public. After authentication is obtained, then the document can be further legalized or consularized wherein the consul office of the jurisdiction where the document is intended to be use will authenticate that the the Deputy Provincial Secretary's Office is recognized by that jurisdiction to authenticate the appointment, signature and seal of the Notaries Public whom signed the document. We can provide legal services respecting domestic contracts [Separation Agreements, Minutes of Settlement, Cohabitation Agreement, Pre-Nuptial Agreements etc.]. You can contact us for your free no obligation initial telephone consultation. ​Understandably parties may want to limit their fees by attempting to limit a Lawyer to “notarizing” or just attending to a party signing domestic contracts, but a Lawyer's role a Lawyer's responsibility may not be limited. There are substantial legal and ethical obligations imposed upon Lawyers for their roles in domestic contracts that go beyond "notarizing" or just attending to a party signing domestic contracts. Lawyers may face substantial personal liability if they don’t satisfy their substantial legal and ethical obligations. (c) To tell a client who takes the position that he or she wants to settle without having received full information from the other side that they may therefore be accepting less or paying more than what would be required according to law, and to provide to that client an assessment of the impact of the risk, including estimates of the value of what might be lost or paid above what was necessary, to the extent possible, on the basis of the information then available. A prudent solicitor would put this advice in writing to avoid later allegations of misunderstanding." The obligations set out in Webb v. Birkett are NOT all of the substantial obligations [and potential liability] of a Lawyer in providing legal services for a domestic contracts as there are a multitude of other obligations and requirements a Lawyer must satisfy in providing legal services. and it is often a Lawyer [NOT a Notary Public] whom can provide the legal advice and services necessary to comply with these requirements. There are competing issues of ensuring recognizing the uniquely difficult and vulnerable context and potential vulnerability of the parties, and that ensuring that there is proper access to justice. If justice isn't accessible [access to the courts, legal representation etc. ], then there will we be injustice, because because of the fundamental role our justice system occupies in our civilized society in preserving rights, obligations and providing a dispute resolution mechanism for the orderly and proper functioning of our society. A properly functioning justice system must also balance the access to justice with ensuring that there is justice done, and due process and fairness is upheld in its system, and the domestic contract context that includes considering the unique circumstances. Domestic contracts arise in circumstances where parties are in a very uniquely difficult and vulnerable context, and persuasive, logical and reasonable grounds to ensure that for the enforceability of the domestic contract that the case law in this area sets out valid reasons to ensure that the process of resolving the breakdown is as much as possible free from exploitation [psychological, informational etc.] of a vulnerable party. Further if children are involved, they as well are uniquely vulnerable and reliant upon the parties, and so the parties, Court and Lawyers involved must consider the bests interests of the children. This imposes obligations upon the parties involved and their Lawyers. If you do choose to contact us if we are not in a conflict of interest, we can proceed with an initial telephone consultation, and discuss what legal assistance you want to retain us for and what legal assistance we consider we can provide depending upon your legal needs and budget as we provide a variety of services ranging from a full retainer to a limited retainer [unbundled services] ranging from a one time case assessment to specific legal steps. We are not retained, nor will we be retained in any initial telephone conversation, and if both of us agree that Lopatka Law should be retained then we will provide a formal retainer letter for you to sign, return a signed copy to us and thereafter for us to sign. If we do not hear from you then we wish you well in your future endeavours and confirm that as with most legal situations time is often of the essence so it will be put to you to take such steps as may be necessary to protect your rights within the applicable legal timeframes, time limits and limitations periods.